We've all heard that you're supposed to drink 8 glasses of water each day to keep your body happy, healthy, and slim. While the specific amount is hotly debated, here are four tips to help you get your daily dose of hydration. We've all heard that you're supposed to drink 8 glasses of water each day to keep your body happy, healthy, and slim. That specific amount is hotly debated, with some experts saying that your total fluid intake can include water, juice, milk, and any juicy fruits and veggies you eat. 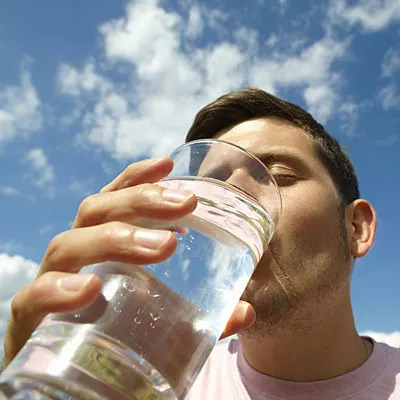 What is clear about water is that it's important to our overall health and well-being since it aids in digestion, keeps us "regular," and helps flush toxins from our bodies. It also hydrates our skin, which keeps us looking younger, and because it's the original zero-calorie drink, it may help with weight loss. All great things, right? But, how do you actually manage to drink all of that water in one day? To help you get your daily dose of hydration, here are four tips to drink more water. Think water is boring? Add some pizzazz to it by lightly flavoring it. Try sliced cucumber or wedges of orange, lemon, or lime. Frozen berries sweeten your water and keep it cold at the same time. Fresh mint adds a refreshing zing to water. With so many different flavor options, it'll be easy to drink more water! Set a goal and keep track. Not sure if you're drinking enough water each day? Set a goal for yourself to drink X amount of water and then keep track throughout the day. Keep a tally on a piece of paper or dry erase board at your desk or on your refrigerator, so you're constantly reminded of your goal. If you want to get high-tech, there are water bottles that keep track for you! Is your biggest problem forgetting to drink water? Try keeping a water bottle with you to encourage constant sips throughout the day. I keep a water bottle on my desk as well as one in my purse, so I can reach for it all day long. Keeping a water bottle with you is a constant reminder to drink up! Drink a glass with each meal. If you like drinking milk or juice with your meals, try swapping it for a glass of water instead. Can't bear to give up your favorite beverages? Swap water for one or two meals per day or only drink half of your usual beverage and substitute the rest of your meal time drink with water. Read Tina’s daily food and fitness blog, Carrots ‘N’ Cake. Can Pickle Juice Really Cure a Hangover?